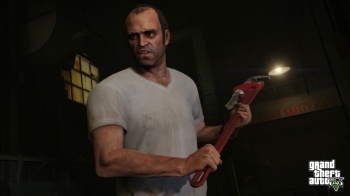 Metacritic Scores Show 2013 as Record for Lowest Number of "Great Games"
Grand Theft Auto V was the highest scoring game on Metacritic of 2013, one of seven console titles to score 90 or higher last year. 2013 saw hits like Grand Theft Auto, The Last of Us, and Bioshock: Infinite, but these three games were one of only seven console titles to score a 90 or higher on Metacritic last year, making 2013 the record for lowest number of "great games." "Great games" on Metacritic are considered 90 or higher. Metacritic notes that 11 console games made the list, but of those 11, seven were unique titles (as several were multi-platform). Including handheld and PC games, 18 games were scored 90 or higher, matching the total in 2012. Metacritic notes this was "an amount that was far lower than in previous years." 2013 was also the year we fully proceeded into the next generation of consoles, and while numbers for PS4 and Xbox One titles were not impressive, Metacritic believes there is hope for better results in the future. It notes Wii U, 3DS, and Vita title scores also improved from the previous year. The PS4 has the highest average Metascore at 73.4 among the consoles and PC, but the system only has one title with a 90 or higher and one exclusive with a 75 or higher. In comparison, Xbox One had an average Metascore of 67.7, zero titles scored at lest 90, and three exclusives 75 or higher. To round it out, Wii U obtained an average of 72.6, three titles scored at least 90, and seven exclusives scored at least 75. PC took home the greatest number of good exclusives - 46. 2013 was certainly not a bad year for games. Review scores aren't the be-all-end-all to games, and last year brought in games that challenged the medium, used the medium to its fullest, and started conversations on games. Most of all, we had a great time playing them.